The first generation iPad still makes an incredible buy for those looking to purchase a tablet computer. Sure the iPad 2 is a nice tablet, but it doesn't take from the value of the iPad 1. For those that don't mind paying the full price of the Apple tablet, I recommend getting the iPad 2. If you want a great tablet at a reduced price, the iPad 1 can be picked up for an incredible value. If you want a new iPad 1 tablet, you can pick one up at Sam's Club. 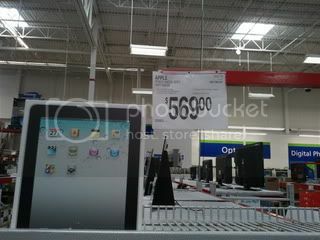 I spotted a 65GB WiFi only iPad 1 today for only $569; compared to the original price of $699. A $130 savings in nothing to sneeze at; you can use the savings towards a case, stylus, software or anything else you will need to make it perfect for you. They did have any other options at all, but paying $70 more than I paid for the 16GB WiFi only model to get 3 times the memory is a fantastic deal. The best thing about this deal is that this is a brand new iPad. If you want an even bigger savings, you can get the iPad cheaper, but it will be refurbished. Apple offers some refurbished models in a few model models, including the 3G models. The refurbished 65GB WiFi only iPad 1 is $529 or $49 cheaper if you don't mind it being refurbished. You don't have to worry about a refurbished iPad from Apple, because they make sure the battery and outer shell is brand new, new box and includes the manual, sync cable and power adapter. Plus it has the same 1 year warranty that a new iPad would include. The lowest model, the 16GB WiFi is only $349. The largest model, the 64GB with both 3G and WiFi was not available at the time I checked, but the stock changes frequently. We have no way of telling how many iPad 1 will remain available, so if you are interested - act fast. I recommend getting the largest storage space you can afford.